The Aerocool X-Fire CPU cooler a nice continuation is Aerocool’s line of CPU coolers of both style and cooling performance. 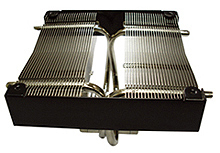 This heatsink utilizes 4 heatpipes and aluminum fins to transfer heat from your CPU to the computer for quick exhaust. On top of great cooling performance the X-Fire is worthy of such a cool name as it has a sleek look from the outside of the computer. Attached to the fins is a 120mm fan, a big fan for quick blow-off heat exhaust keeping your computer flow smooth and efficient. The fan is equipped with quad white LED’s giving a cool X symbol in low lighting. Height: The height including fan is 4"